There were a couple of days where I didn’t get a lot of sleep. I can’t remember what I did where I had less than five hours of sleep. 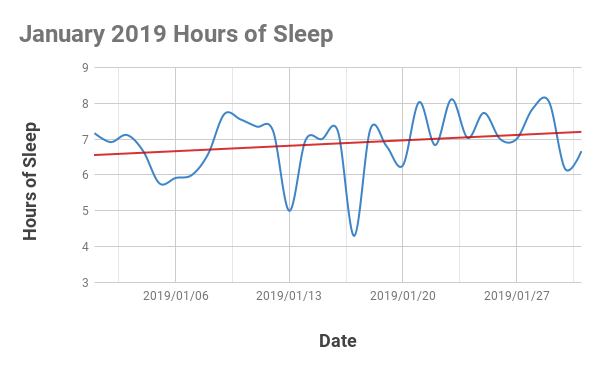 I got a little bit better with the sleep at the later half of the month, though. Overall, an average of seven hours of sleep isn’t too bad. 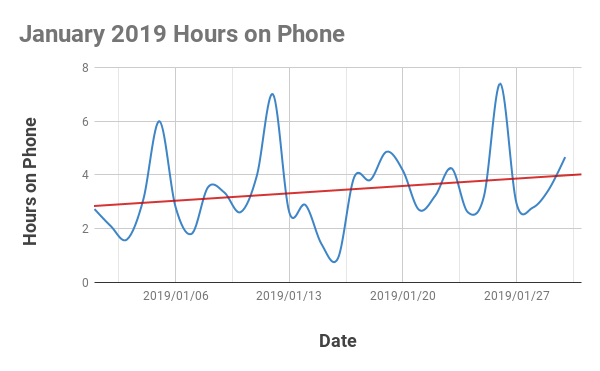 I really don’t know how I managed to be on my phone for almost eight hours two days in a month. Admittedly, I haven’t been using my Forest app to keep me off of my phone as much. I might need to get back at it so that I’m more mindful of my time. This is pretty typical of me. The weekends are usually when I don’t walk around much, which are represented by the dips. 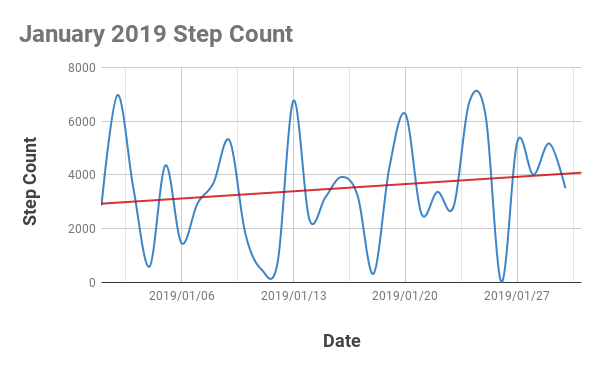 4k steps aren’t a bad average but I’ve definitely done better. This is out of my control but it’s a cool thing to look at. 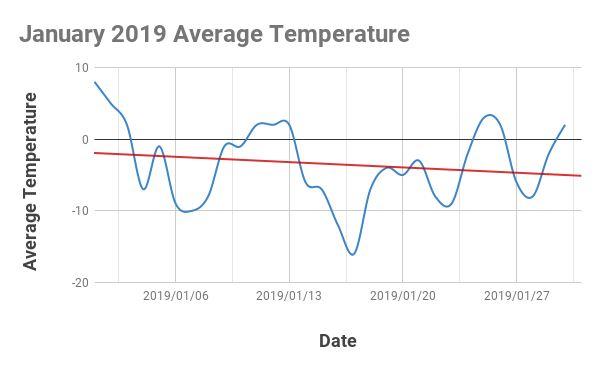 This winter has been so mild in January. There was a lot of days where we were above zero and there wasn’t too much snow. The trend down is pretty accurate, however. 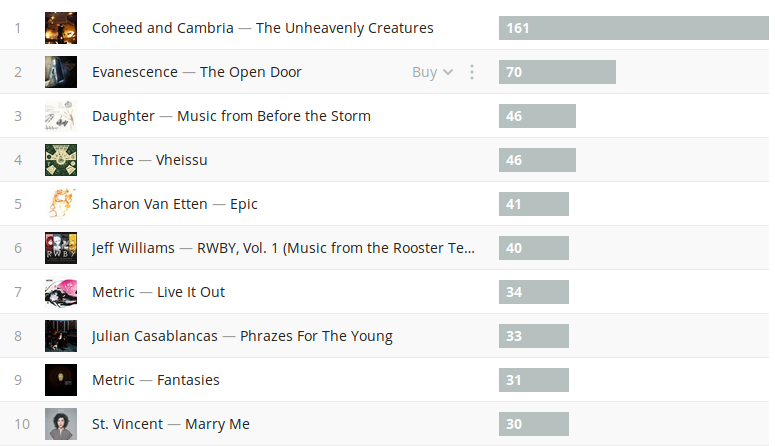 I think one day I just decided to listen to Coheed and Cambria on repeat. And with Metric coming to Calgary soon, I was trying to determine whether or not I wanted to go see them. I decided that I did want to see them but then I learned that the only tickets available now are the expensive VIP tickets. Nope. I don’t know why Spotify loves to favour Evanescence all the time. 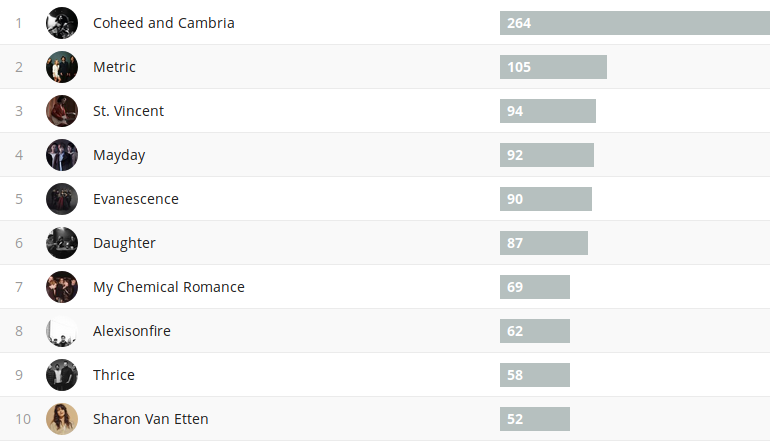 I swear I don’t listen to that much Evanescence. Sharon Van Etten came out with a new album recently. I’ve only listened to her second album, which is a very bare and simple album sung to a twangy guitar. Her latest album is very heavy as in thick with synths and effects. They’re very different but I dig it. There was a moment where I just wanted to listen to the Life is Strange: Before the Storm soundtrack over and over. It’s a beautiful album and Daughter did an awesome job. I just listened to The Unheavenly Creatures on repeat for like a day. I still cannot get enough of the album, surprisingly. 9 out of 10 of the songs come from my “Sad Girl” playlist. Look, there’s even a song called Sad Girl up there. 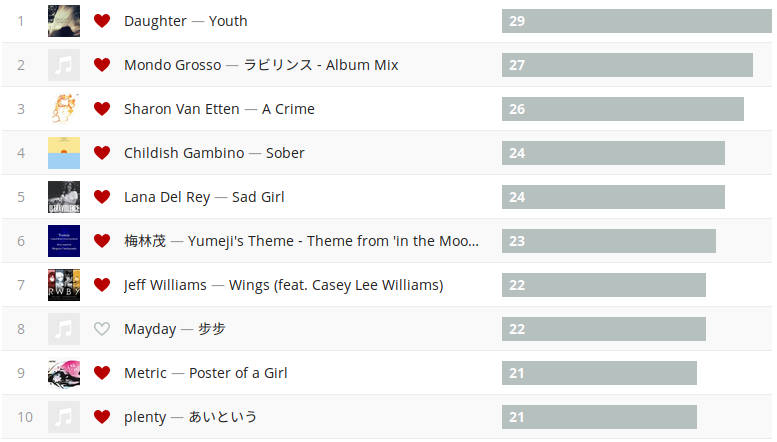 Jokes aside, I really do like these songs even if they’re #sad. The more that I think about it, Poster of a Girl could definitely qualify to be on my “Sad Girl” playlist. Sometimes I wonder, “Where does my money go?” It’s reassuring to know that 80% is going towards savings. Most of my bills cover my phone and transit passes. Expenses range from everything to buying weed (it’s legal in Canada), razors, gum, etc. Fun is most definitely just me going out to eat lunch or dinner with coworkers or friends. My optional bills are for things like Spotify, domain names, etc. I’m currently on a family plan with some coworkers so I only need to pay $2.50 per month for Spotify. I just paid $30 up front for the entire year. 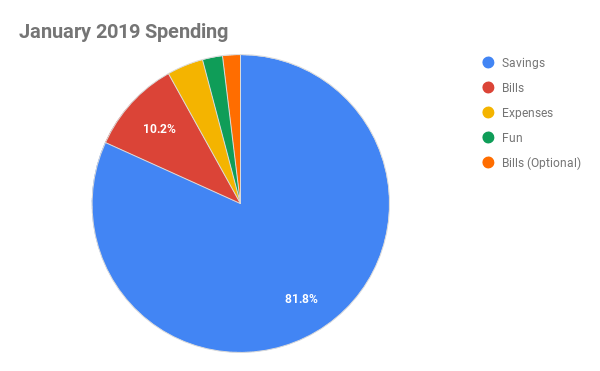 I imagine that this pie chart will stay the same for February. I’m currently saving up a lot so that I can move out in a couple of months. January was a roller-coaster of a month. A lot has happened. I felt like I was bouncing all over the place. Things started to stabilize around the end but I’m determined to get back on the proverbial wagon.